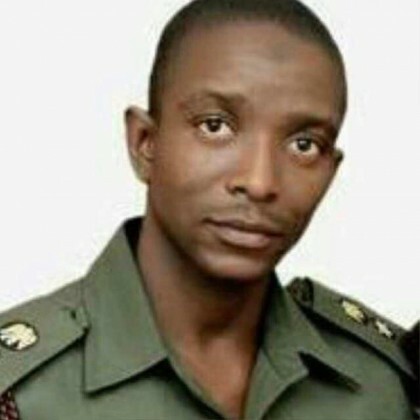 Ahmed Manzo, Abuja: Hardly has a story of bravery evoked such passion in recent times amongst Nigerians as is being told of Late Lt. Col. Muhammed Abu Ali who died in confrontation with Boko Haram insurgents in the theatre of war against Boko Haram in the North Eastern part of Nigeria. Muhammed Abu Ali was born on the 15th of August, 1980 in Lagos State. With parents hailing from Kogi State, he attended Army Children’s School in Maiduguri and later on joined Command Secondary School, Jos. He joined the Nigeria Defence Academy in 1998 and became a commissioned officer in 2003. On the 25th of January, 2008, he and his heart throb whom he met in Kaduna got married and were blessed with 3 children, Fatima, Amir and Yasmin. Popularly called “Slim” by his friends and “Sarkin Yaki” by fellow combatants. He was known as a human terror to terrorists for his daring campaigns as Commander of the 272 Task Force Battalion. He fought for the glory of nation and was unshakable in his steely resolve to retain the territorial integrity of Nigeria, a price that came with the sacrifice of his life in the line of duty. A patriot per excellence and an unyielding force to enemies of our nationhood, Lt. Col Muhammed Abu Ali was not one to shy from battle. Under very difficult circumstances, he and his men successfully recovered scores of towns from Insurgents. From the frontlines, it is reported that he was instrumental to the military campaign that won back Baga from the stranglehold of Boko Haram. From soldiers in the frontline, we learn that he initially started his brave conquests from Yola, in Adamawa State from where he was moved to Borno. He and his battalion later moved to recover Monguno and later to Konduga – dreaded no-go areas of battle. Through Yale, he and his battalion were again instrumental to the recovery of Bama, Pulka and eventually Gwoza back to control of the Nigerian forces. The stories of uncommon courage that trails his achievements on his military assignments are unending. He was reputed as telling his men to load him up with 95% of the duties of engagement. He was a dutiful officer and will be missed by millions of Nigerians who today have come into new realisations of the challenges of the war front. Described by Coursemates as an irreplaceable asset that Nigeria will miss, Lt. Colonel Muhammed Abu Ali is a towering source of inspiration and will now serve as a rallying point for a united re-assessment of the support that our Men and Officers require for success. His, will also be a painful loss of friendship. Rest in Peace Gallant Soldier. Nigeria appreciates you.